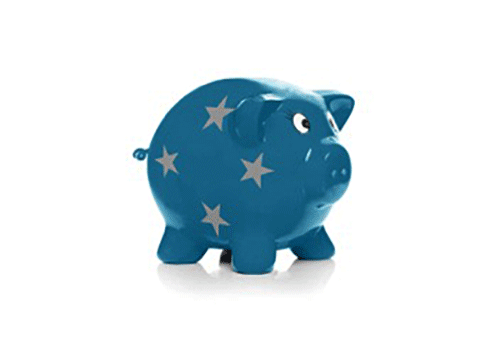 CORE's Ten Trends for 2014 have been published. This post considers the first of these trends: Learning Agency. We shall be publishing posts on one of the trends approximately each month. You are encouraged to comment or provide supporting links. The concept of agency has been central to educational thinking and practice for centuries. The idea that education is the process through which learners become capable of independent thought which, in turn, forms the basis for autonomous action, has had a profound impact on modern educational theory and practice. One way of thinking of learner agency is when learners have “the power to act”. When learners move from being passive recipients to being much more active in the learning process, actively involved in the decisions about the learning, then they have greater agency. There are three things that I think are core features of our understanding of learner agency. The first is that agency involves the initiative or self-regulation of the learner. Before a learner can exercise agency in their particular learning context they must have a belief that their behaviour and their approach to learning is actually going to make a difference for them in the learning in that setting – in other words, a personal sense of agency. The notion of agency involves a far greater tapestry of intentionality on the part of schools and teachers to create that context and environment where the learners are actively involved in the moment by moment learning and well being. Second, agency is interdependent. It mediates and is mediated by the sociocultural context of the classroom. It’s not just about a learner in isolation doing their own thing and what suits them. Learners must develop an awareness that there are consequences for the decisions they make and actions they take, and will take account of that in the way(s) they exercise their agency in learning. And thirdly, agency includes an awareness of the responsibility of ones own actions on the environment and on others. So there’s a social connectedness kind of dimension to that. Every decision a learner makes, and action she or he takes, will impact on the thinking, behaviour or decisions of others – and vice versa. You can’t just act selfishly and call that acting with agency. We could start by adopting the use of individualised education plans (IEPs) as a way of personalising the approach to learning, not just in terms of the delivery, but in terms of the learners’ ownership of that learning – the direction, content, process, and assessment of that learning. It is critical to consider the pedagogical approaches that are adopted by teachers and schools, and to question and challenge those that are overtly teacher-centric, with an emphasis on delivery and curriculum coverage. Learner agency will develop when learners are involved in the whole learning process – including decisions about the curriculum itself, involving learners a lot more in the choices about the what as well as the how and the why of what is being learned. We need to consider student voice is that reflected in the day to day decisions that are made around school – not simply in order to satisfy ourselves that we’ve heard what students have to say, but in more engaged and authentic ways that are about their learning. What use is made of IEPs in your school to enable the development of a personalized approach to teaching and learning? Who designs these? Who has access to them? How is student voice reflected in all aspects of school life? What safeguards do you have for ensuring no students ‘fall through the cracks’? It is nearly a quarter century since Neal Stephenson wrote Snow Crash, and exactly thirty years since William Gibson gave us Neuromancer. These two cyberpunk novels, along with the films Blade Runner and The Matrix, triggered the consensual dream that reality would merge seamlessly with a computer generated virtual reality in which our avatars had superhuman powers. Riding this wave, many educators were drawn to Second Life. But Second Life is resource-hungry, and it kind of coincided with the move away from desktops towards laptops. So, firewalls, capped data accounts, slow networks, inadequate processing power, and smaller screens caused interest to wane. While games and virtual worlds engage us deeply, our experience is still constrained to a flat screen; true immersion continues to elude us. But there is a change coming, and it is being brought about by faster processing, better screen resolutions, cheaper hardware, and the sheer genius of a generation of young entrepreneurs. Key to this change is the re-discovery of a 100-year-old technology — stereoscopy. The device we all know and love is the View-Master. The red binocular viewer with the lever on the side for advancing the circular disc never ceases to give pleasure. I dug out ours, and looked through Muppet Treasure Island, and Thunderbirds. 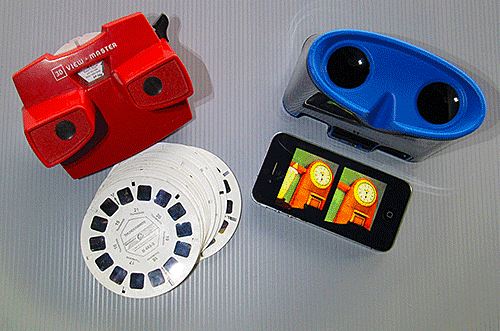 The View-Master is a useful object to think with, but all it delivers is a still image with an illusion of depth. It’s interesting, but it doesn’t go far enough. I searched around and found the FOV2GO system from University of Southern California, also the Hasbro MY3D system. Both slot an iPhone into a binocular viewer. I acquired the Hasbro MY3D viewer because it was easily available on Fishpond at a cost of just $25. When I couldn’t find the advertised apps for the Hasbro I tried the Tales from the Minus Lab app from USC. The result is a powerful illusion of moving around inside a 3D world. I have to say that the first few minutes caused me to go, “Wow!” and, “This is incredible!” Then I started to feel a little motion sick, which is common in virtual reality environments. Ten years from now I’m sure such things will be commonplace; teachers will work with learning technicians to create authentic scenarios, and the $100 headsets will just be lying around in the modern learning environments the students inhabit. No-one will give it a second thought, but right now it’s still one of the challenging frontiers of ed-tech. And the challenge I'm putting forward here is not to seek funding for some behemoth project that will take a year and either succeed or more probably fail in some spectacular way, but to spend a little time seeing what Alberto Savoia has to say about pretotyping, and kicking off with some light, agile, low-stakes thing. And then sneak it up on your students and just see what they make of it. This is a community of practice, and we love to share. Please tell us about your experiments and how they go. A $359m education initiative announced by the Prime Minister last week has a direct focus on raising student achievement. It involves recognising excellent educators by creating four new management roles for schools – change principals, executive principals, expert teachers and lead teachers. A major tenet of the plan will be a focus on collaboration between schools. If National wins the election, it plans to introduce the four new roles from next year. Change principals: tasked with turning around a struggling school. Twenty positions nationwide, each receiving a $50,000 allowance per year on top of their base salary. Executive principals: ‘highly capable principals’ with a proven track record who will lead and mentor other principals in their community. Two hundred and fifty positions nationwide, $20,000 allowance per year. Expert teachers: will work with the executive principals in specific areas like maths, science, technology and literacy. One thousand positions nationwide, $20,000 allowance per year. Lead teachers: ‘highly capable’ teachers with a proven track record who will act as a role model for teachers in the wider community. They will have an open classroom to allow other teachers to observe and learn. Five thousand nationwide, $10,000 allowance per year. The commitment of such a large sum of money to support what is effectively a 'culture-change' strategy for New Zealand education heralds the most significant change since the 1989 reforms of Tomorrow’s Schools which sent us along the pathway of school autonomy and competition. PPTA President Angela Roberts says that the $359m investment, while not being a silver bullet, is a positive step and she believes that the new roles will lead to more collaborative approaches. She says that enabling schools to support each other rather than compete against each other is a good response. Gail Gillon, pro-vice chancellor at the College of Education, University of Canterbury also welcomes the more collaborative approach and says that the government has accurately identified one of the key challenges in the schooling system. It appears that most public response to the initiative has been cautiously optimistic. While this is a good start, as educators, we can’t afford to be uninvolved, standing back to see if it will work. Real transformation of schooling needs to involve everyone. To bridge the gap between good ideas and effective action we will need to act collectively, each one of us personally stepping outside our ‘autonomy bubbles’ and starting to make a bigger space for collaboration in our professional lives. So how do we shift our mind frames from acting as working groups – as people acting alongside each other, to functioning as teams where collective action contributes to a whole result? History has shown that events where large numbers of people have made a powerful move together have usually been born out of an experience of difficulty or injustice. Maybe education’s current disparate impact on a large percentage of New Zealand children makes this one of those important times. However with the best will in the world, we can’t all be executive principals and lead teachers. So where to begin? Small is Beautiful: A Study of Economics As If People Mattered by E. F. Schumacher is about small, sustainable acts and appropriate technologies. His notion of ‘smallness within bigness’ is useful in determining the value of our individual input. We can start small. So, in partnership with National’s initiative, what if several thousand acts of real collaboration and teamwork by New Zealand teachers were equally as powerful as an investment of $359m? Working together, could we exponentially increase this investment in our future? Let’s not just stand back to see what happens, let’s lean in, operate within Schumacher’s ‘smallness within bigness’ notion and function as a team with this initiative. An opportunity for a ‘leg up’ has appeared – let’s take it.